Sestak: 'Rogue unit' abused gay sailor. WASHINGTON (CNN) - Rep. Joe Sestak, a Pennsylvania Democrat who served in the Navy for 30 years, called a group of servicemen responsible for hazing a gay colleague a "rogue unit" and an "aberration." Sestak told CNN Monday that the case of Joseph Rocha, a gay sailor who was abused by his colleagues in a canine unit in Bahrain, was "almost nauseating." Rocha in an earlier interview said his supervisor was responsible for the hazing and said he believes that the military's "don't ask, don't tell" policy – which bars gays and lesbians from openly serving - played a role. Sestak has asked the Navy to do a further investigation into the case and he told CNN that "don't ask, don't tell" should have been repealed a long time ago. "We should have done away with it years ago," Sestak CNN’s “The Situation Room.” "We're absolutely not adhering to the ideals of our nation, that everyone is treated and respected equally, and I think that was part of what led to this. Although on the whole it's a lack of accountability, and I hope that this year, prior to December, that our president having taken care of the economy and health care is to then repeal 'don't ask, don't tell.'" Then they need to provide separate berthing and heads for homosexual Sailors, simple as that. It is a detractor for morale to have it any other way. The officer in charge should be dishonorably discharged and stripped of all rank. I'm so tired of the "little guys" getting punished for following orders from sadistic officers. One thing and a time. I wouldn't rate this with the most demanding issues on the Presidents plate. I do believe it needs to be addressed, but not right now! It is unfortunate that people aren't willing to understand that there are people that are different from themselves. I would hope that people would be willing to live and let live when it comes to things like being a homosexual. I know that there are people out there that don't like some or lots of other people, but they need to know that there are people out there they won't or don't like that they can trust with their live as they serve in the military. This is a dangerous road to go down. Being new to a military unit is hard enough, the rules regarding hazing are very strict but it doesnt stop people from crossing that line. But worse than actual hazing is treatmeant that doesnt cross the line and is perfectly legal under the UCMJ (military law.) Did anyone stop to think what the men and women of the military want? Because it might be a big political show to everyone else but civilians are not the ones who have to live with the decision. If they repeal dont ask dont tell then are gays going to want speacial treatment and rules just for them? Where will gays shower? With straight men? If so, what's the difference then if straight men ask to shower with women? Hazing is prevalent in all armed forces units. This is why "don't ask don't tell" is a necessary policy. The gay community has every right to practice their relationships in society - I am even for their rights to marriage. But this kind of protest highlights the non-gay vs gay "hazing" more than the standard non-gay vs non-gay "hazing" as if it was special for some reason. Enough of the "racism" cries in America already. This is nonsense. Why is hazing tolerated at all? We are supposed to be "more outraged" because a gay person (or a black person? or a white person?) is molested or raped or abused? Watch your back! You have a 30 year history of military service! My concern is that the "right wingnut chicken hawks"–Limbaugh/Hannity/Beck–will become part of a sneak attack on your record. Be prepared to take them on with slash and burn tactics of your own! as a retired navy Senior Chief, I can tell you that knee jerk witch hunts and letting gays serve openly will do nothing to eliminate these incidents. Not saying its right...its just not going to change anything. Sorry but you can't control people's opinions. "don't ask, don't tell" is serious discrimination and as a country we should be ashamed. That sounds like everyone in Congress. Don't ask us what we are doing and Don't tell us what to do. What a bunch of idiots we have running our contry. 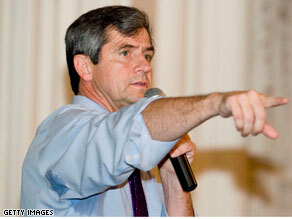 Sestak is just one more dummy speaking out. Obama can pick up the phone and say "end the policy". He is the Commander in Chief now folks. Time to step up and actually keep one of his promises. Hazing should be outlawed in all its ugly forms! If someone is willing to join the armed forces and has proven they will fight and risk their lives to protect our country and its ideals they should be respected for this by their peers! It should not matter what they do in private. Or who they do it with!